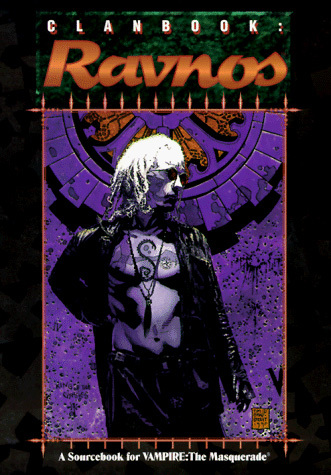 In this episode, we review and discuss the Ravnos Clanbook. Known for being wandering vagabonds and hucksters, the Ravnos are charlatans who gleefully practice their arts of deception and theft. This review marks the final Clanbook review of Second Edition. You may have noticed, this clanbook actually came out before Clanbook: Giovanni. That's because I messed up the order. These things happen. Thanks to all of you who have listened to us over the past year! We've had a great time doing this podcast, and all the kind words and support have been awesome and overwhelming! Here's to another great year of content, and to all the new White Wolf material coming down the pipeline! You folks are a wonderful community! Click here to buy the book and help support the show via Drivethru RPG! Gypsies, vagabonds and charlatans, the cunning vampires of Clan Ravnos roam the night as they indulge in the most dangerous of games — lying to the liars, tricking the tricksters, and gleefully receiving curses from the Damned. From Bel Air to Bombay, from Shanghai to Sarajevo, these nomadic vampires wander where their citybound Kindred fear to tread. Now learn of the Ravnos' secret arts, and the centuries of hate that can lie behind a jester's smile.